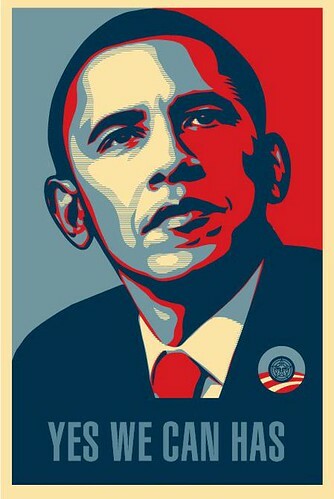 Is anyone else a bit creeped out by Barack Obama's embrace of pseudo-fascist propaganda style art to promote his campaign? Is hope and change only possible through worshipful adoration of our great leader? He'll make the trains run on time! Here you go. This is gonna be fun. Um, if by "embrace" you mean some guy not affiliated with the campaign drew a picture. No, by "embrace" I mean taking the art made by that guy "not affiliated with the campaign" and selling it through his campaign store, which I presume is affiliated with the campaign. But perhaps that's too nuanced for you. you're right. it is fun! welcome to marcland, an elegant tapestry of quotations, musings, aphorisms, and autobiographical reflections. • What Would Tyler Durden Do? • Watts Up With That? • Is Barack Obama the Messiah? • Mother, May I Sleep with Treacher?